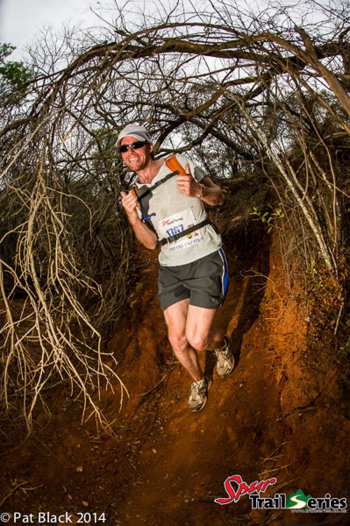 What an adventure on Titan’s Forest trails in race 2 of the Gauteng Summer Trail Series! A brand new addition to the trail running scene, it was with great anticipation that trail runners lined up at the start line from 7 am on Sunday to run this magic piece of private Broederstroom property. Majority of the route focus was the spectacular forests that lined the source of the Broederstroom spring. Being able to drink from the spring during the run was a really unusual highlight for many. The trails were undeniably busy, with a huge variation in steep technical climbs & descents, fast winding trails through the forests complete with lots of tricky valleys and slate-covered ridges. Diversity second to none. This busy run meant you hardly had time to realise where you were before you found yourself back at the finish! Carl Sandrock commented, “It’s like a complete cerebral overload!” We think this summarised the Titan’s Forest experience to a T! Shorted from 14km before the start due to some unforeseen circumstances, the Championship (Long) course took on more of everything as we stretched out the route to cover a large portion of this magnificent property. 28-year-old Bernard van der Kuil totally owned the route, completing the 13km in 56:38, over 5 minutes ahead of second place Leon Scholtz. Craig Makopela rounded out the top three in 1:02:47. Behind Bernard in the Open Senior category, Stephen Atkinson took 2nd place with Tim Price rounding out third. Wildcoast Wildrun record holder Marelise Retief and Penny Bowren were separated by just 53 seconds in the ladies race, with Marelise taking her second race win in a row in 1:03:19. Their respective times put them at 4th and 5th place over the line respectively. Michel Botha completed the top three over the line in 1:18:30. In the ladies open/senior category Thea-Mari Franken moved into 3rd behind Michel Botha. The veteran men's race is was Leon Scholtz in the lead in 1:01:51, with Craig Makopela and Mark Phipson in 2nd and 3rd respectively. Karen Ellithorne lead the charge in the Vet ladies race, winning in a time of 1:34:28. Karen was chased hard by Sharon Masson in 2nd, just 9 seconds back, and third was Sarah Hanson in 1:36:22. Gert Steyn held on to a narrow 32 second lead over Martin Stumbles in the men's Masters race, with Douw O’Kelly rounding out third. Behind a rampant Penny Bowren in the ladies Masters competition, came Lois Spies in 2nd and Jacqueline du Toit in 3rd. And last but not least a special shout out to George Lupton-Smith for his lead in the provisional Grand Masters category! 14 year old Tiaan Dorfling clearly revelled in the technical trail, dancing his way to the finish line in the 7.4km Challenge course in an incredible time of 30:11 - over 10 minutes ahead of second placed Rob Donkin, who in turn was less than two minutes ahead of his 12 year old son Joel. That puts two 11-14 year old “Minimee” into the top three over the line! Rounding out the minimee category was Stuart Phipson in 42:46. Charine Kruger completed a top 10 finish in the short course ladies race in 45:47, with a two minute lead on Leanri Williamson. Domenique Walters rounded out the top three ladies over the line just one minute back from Leanri in 48:51. In the 6-10 year old “Peewee” category is was the usual all guns blazing approach by the little runners. 10 year old Scott Williamson took line honours in this category in 45:36, which also secured him a top 10 placing. Chasing him down with pedal to the metal was Kayden Durrie (10yrs) and rounding out the top three was Noe Cadion - also 10 years old. In the Veteran category, the ladies race was won by Janette Bewsey in 58:21, followed by a close tussle for 2nd and 3rd between Elke Thompson and Marinette le Roux - with Elke managing to eek out a mere 4-second advantage at the line. The Veteran men's race was won by Rob Donkin (2nd over the line) in 40:08, followed by Johan Kruger in 45:44 and Jason Reeves in 48:05. Gerrie & Christa Coetzee took charge of their respective Masters categories. Tyrone Gower and Johnnie Jonker took 2nd and 3rd respectively in the men's race, and Eva Alexandrova & Linda van der Gryp 2nd and 3rd respectively in the ladies. Huge thank you to Titan’s Forest for hosting us and to our key sponsors Jaybird and Raidlight! 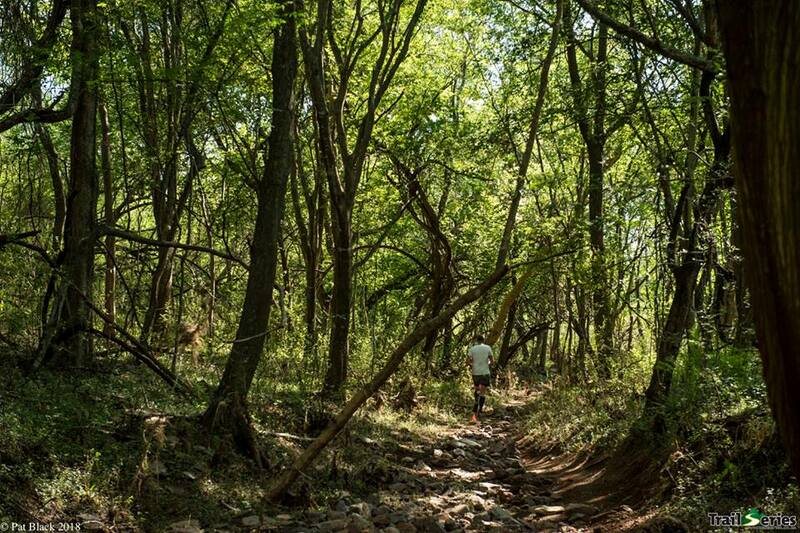 Almost 700 trail runners made their way to the Pelindaba Nature Reserve on Sunday to take on the final race of the Spur Gauteng Summer Trail Series™ and one of the last trail races of 2014. They weren’t disappointed as the Highveld weather played along, delivering a perfect morning to kick off a typical summer Sunday. The racing on course was as hot as the temperatures and it was a fantastic way to finish what was another unforgettable Spur Trail Series™. Some of the biggest names in South African trail running showed up to join in the fun but it was Edwin Sesipi, a regular on the Spur Trail Series™ circuit, who came out on top and claimed the overall long course Championship. Sesipi had to fight off strong competition in the form of the national long distance trail running champion, Thabang Madiba, Drakensberg Grand Traverse record holder, Ryno Griesel and young gun, Ruan Meintjies. He showed his class though and made it three out of three in this year’s Series as he blitzed the 11.3km long course in a time of 42:48. Meintjies chased all the way to finish only four seconds behind him and claim second place in the Series. Third over the line was Madiba in a time of 45:17, with Tranquil Gumbo coming in fourth to claim third place in the Series. In the ladies race it was Nicolette Griffioen and Meg Mackenzie who chased each other at the front of the field to be the only ladies to break the hour barrier. Griffioen came out on top with a time of 55:06 with Mackenzie following shortly after in 55:40. Third over the line was Nerissa van der Walt, coming in just over an hour in 01:02:21. Lerentia Strydom crossed the line fourth, just ahead of Takalani Ndandani, but this was not enough to claim the Series title as Ndandani walked away with the better result over all four races. Luke Schlebusch made it three in a row as he was first over the line again in the 6.9km short course Challenge race. He finished in a time of 26:43 in front of Ryan Mathaba who came in in 27:48. Third over the line was Honest Mathe who crossed the line 28:13. Mathaba also claimed the short course Challenge Series title while Schlebusch, who was competing in the junior category, took first place in this category. The top three female runners in the short course Challenge continued the trend they had set and finished the race in the same order as the overall Series results. Adél Terblance claimed her third straight win and was the only lady to cross the finish line under 35 minutes. She won the race in a time of 34:20 ahead of Vimbainashe Mhike who came in at 35:17. Zoe Brentano, another regular at the Spur Trail Series™ took third place with a good time of 38:22. It was the perfect end to what was a fantastic Series with Gauteng trail runners coming to the party every weekend. It’s great to see how the sport of trail running keeps growing across the country and we can’t wait to return up country next year to have more fun with the Gauteng crowd. A big thanks to our sponsors, Spur Steak Ranches, adidas, BOS Ice Tea, Protea Hotels, Graham Beck wines and Runner’s World for their continued support to make the Spur Trail Series™ possible. And of course a massive thanks to the runners without whom none of these events would be possible. See you in winter Gauteng! Click here for full results and here for photos. Follow us on Facebook at www.facebook.com/trailseries and on Twitter@WildrunnerZA for regular updates on all our events. It was a scorcher of a day as approximately 600 runners lined up for the start of Race 3 in the 2014 Spur Gauteng Summer Trail Series™ that took place on the magnificent trails of B’sorah. In the men’s 13,4km long course Championship race, it was a titanic duel between the top two men as they opened up a big gap on the rest of the field. Neither could shake the other and the battle lasted up to the finish line as they hurtled down the last few km’s. Finally as they hit the last few bends, Edwin Sesipi opened up a small gap that he would not relinquish as he came home to win by seven seconds in front of a hard chasing Tranquil Gumbo. Sesipi’s time was a superb 50:40 with Gumbo coming home in 50:47. Third over the line went to Daniel Jenner who crossed under the arch in 59:27 to claim his first podium placement this Series. In the ladies long course race, it was the familiar figure of Lerentia Strydom who came down the finishing straight in first place as she opened up a gap on Series rival Takalani Ndandani who came home in second place to keep the Series well and truly alive. Strydom came home in 01:04:25 with Ndandani crossing under the arch in 01:06:06. Third over the line went to Michelle Smith who ran a terrific race to post her time of 01:08:03. For the second week in a row, Luke Schlebusch was welcomed home as the first person across the line in the short course, covered the 6.7km short course in a personal best time of 25:17 to better his time from the last Summer Series by 14 seconds. Not far behind Schlebusch was Series leader in the men’s Open category, Ryan Mathaba, who ran a smart race to cross the finish line in 25:38. Anrich Zimmerman stayed consistent and crossed the line in third place overall with a time of 26:01. In the ladies short course race, Adel Terblanche took home her second win on the trot in a time of 31:03 to boost her chance of an overall Series win with Zoe Brentano claiming second over the line in 31:24. Third over the line went to Vimbainashe Mhike, herself having a fantastic Series, who ran home in 32:05. Despite the heat, it was a fantastic Sunday spent in nature and if this week’s results are anything to go by, we are in for a cracking Series finale in three weeks’ time with a host of Series categories to still be decided. We look forward to seeing you at Pelindaba on the 30th of November! Thanks to our brilliant sponsors; Spur Restaurants, adidas, BOS and Protea Hotels for making this Series possible. Click here for full results and here for more photos. The magnificent Segwati Game Ranch played host to race 2 of the Spur Gauteng Summer Trail Series™ under grey but dry skies to make for perfect conditions to be out on the trails. 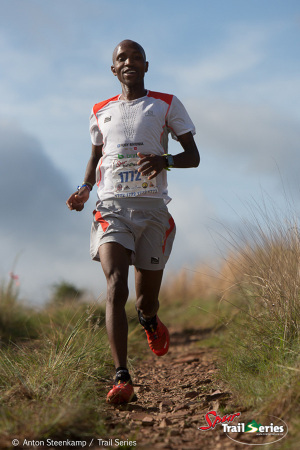 The 13.2km long course Championship race saw one of the country’s top trail runners and indeed the 2013 and 2014 South African Long Distance Trail Running Champion Thabang Madiba, who came out to race in the Series where it all began. Madiba didn’t have it all his own way however, as there was fierce competition from the young pretenders with up and coming star, Ruan Meintjies taking home the win in a sensational time of 48:08. Not only did he beat Madiba but he also improved the time set by legend, Luck Miya in last year’s race by more than 90 seconds! Trailing Meintjies by a shade under one minute was last week’s XL winner, Tranquil Gumbo who ran home in 49:07 with Madiba claiming third over the line to round off an impressive overall podium. In the ladies long course Championship race, Takalani Ndandani showed her class as she crossed under the arch in a terrific 01:05:42 with Lerentia Strydom, the winner of the XL in race 1, taking home second place over the line in 01:06:15. Rounding out the top three ladies over the line was to Benita Kritzinger who ran home in 01:07:57. Luke Schlebusch managed to break the half an hour mark in the men’s 7.4km short course Challenge race as he blitzed home to win in 29:30 with Ryan Mathaba adding another second place to his Series results to keep himself in the running for the overall Series win in his category. Third over the line went to last week’s overall winner, Anrich Zimmerman who crossed under the arch in 31:08. In the ladies short course Challenge race, Adel Terblanche and Vimbainashe Mhike traded places as Terblanche took home top honours this week ahead of Mhike – Terblanche running home in a time of 37:10 with Mhike crossing the finish line in 38:11. Taking third place over the line was young Kayla Visagie who was hot on the heels of Mhike coming home in 38:22. For full results click here and for more photos click here. Thank you to all who came out on a great morning. 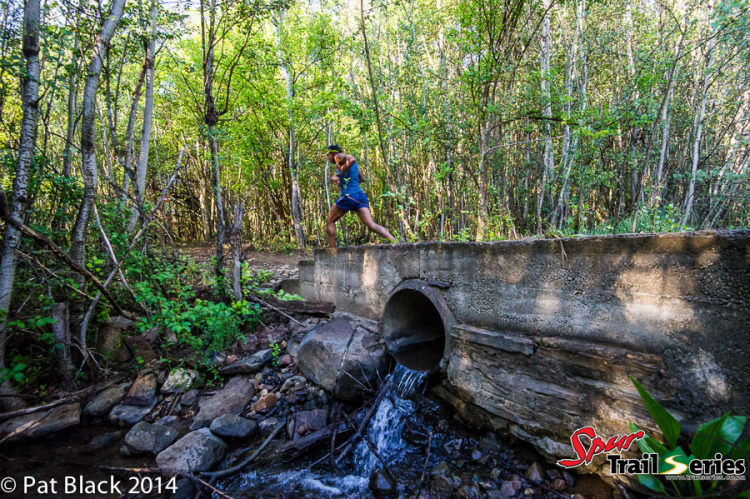 We look forward to seeing you all again this Sunday at B’Sorah for race 3 of the 2014 Spur Gauteng Summer Trail Series™. Thanks to our fantastic sponsors, Spur Steak Ranches, adidas, BOS and Protea Hotels for making this Series possible. 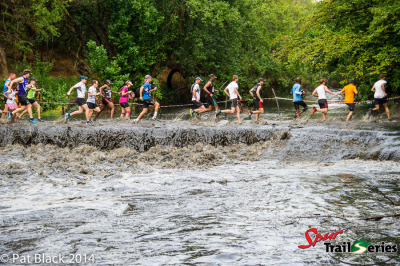 It was a stormy start to the 2014 edition of the Spur Gauteng Summer Trail Series™ as an angry Hennops River greeted more than 600 runners to kick start things off in dramatic fashion. As per usual in the Spur Gauteng Trail Series™, the Hennops race hosted the stand alone event of a 20km XL race and this year’s event saw one of the most dominant displays of running as regular podium placer, Tranquil Gumbo blitzed the course in a time of 01:38:12 to win by just under 30 minutes. Johan Ferreira took second over the line in 02:07:37 as well as first master, with another master runner, Mike Biesheuvel hot on his heels in a time of 02:07:43. In the ladies XL race, it was Lerentia Strydom who took top honours and finished a superb eighth overall in a time of 02:12:35. Benita Kritzinger claimed second over the line in a time of 02:20:13 and claimed the title of first veteran female with third place going to Birte Toussaint who crossed the line in 02:22:45. The men’s long course Championship series got off to a great start as two young men showed their intent and put in a strong showing. It’s sure these two will fight tooth and nail throughout the course of the next three races to claim the Open Championship title. Seizing the early initiative was the current winter Championship holder Edwin Sesipi, who ran the 12km long course in 57:06 – a mere 45 seconds ahead of Ruan Meintjies who crossed under the arch in a time of 57:51. Coming in third was Eduan Neeb with a time of 01:05:04. The race for the line in the ladies Championship race was equally intense as Jenna Bowes came in only four seconds ahead of veteran, Christel Nell. Both ladies ran a super impressive race to finish in 01:28:27 and 01:28:31 respectively, ahead of perennial podium placer, Takalani Ndandani in 01:29:24. 16 year old Anrich Zimmermann showed just how much he has improved during spring as he claimed the win in the 5km short course Challenge race by pushing Ryan Mathaba, a regular top spot finisher and winter series winner, into second place to set up what is going to be a fantastic battle between these two! Zimmermann came home in a time of 22:56 with Mathaba less than a minute behind in 23:47. Third place over the line went to Jaco Jonker, himself no stranger to the Spur Trail Series™ having previously been one of our sweep runners! Just goes to show you, sweeping can be good for you! In the ladies short course race, the win went to Vimbainashe Mhike who crossed the line in 26:58 to claim top spot by quite a margin in front of Anel Terblanche who finished in 30:32. Third over the line went to junior runner, Kayla Visagie who reminds us what a talent we have on our hands in the trail running community and certainly one to watch out for going forward. A big thanks to all of those who turned up in challenging conditions and we look forward to seeing you all again this Sunday at Segwati Game Ranch for race 2 of the 2014 Spur Gauteng Summer Trail Series™. Thanks to our fantastic sponsors, Spur Restaurants, adidas, BOS and Protea Hotels. For full results click here and for more photos click here. Like our Facebook page and follow us on Twitter@WildrunnerZA for regular updates.